Last weekend at Sandos Cancun Luxury Resort, we had a night we’ll never forget. Two of the original members of top Mexican pop groups Timbiriche and Fandango came to Cancun to sing some of their biggest hits: Alexa and Mano Gaytan! And so on Saturday, March 18, we got everything ready for a concert and dinner by the Caribbean Sea, all in our beautiful beach club area. The “Juntos” concert (which means “together” in Spanish) began at 9:00 pm, and the audience had the chance to experience a night of Mexican nostalgia thanks to the voices of singers Mano Gaytan and Alexa. While we enjoyed the mouthwatering gourmet cuisine of Sandos Cancun Luxury Resort, Mano and Alexa sang a variety of Latin American pop hits like “Corro, vuelo, me acelero”, “Yo no te pido la luna” and more. Not only did the concert sell out of tickets, but we even had to add extra tables! What a great crowd! 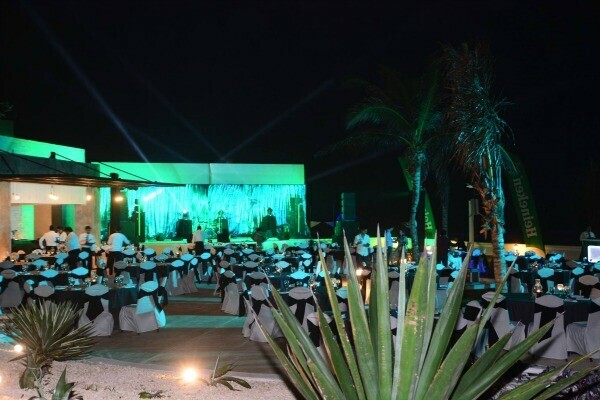 It was an evening of beach, cuisine, stars and Mexican pop-rock music with a dreamy beach setting that only Cancun can offer. To see more concert photos, visit our photo album on Facebook. Experience Our Other Big Events! Sandos Cancun Luxury Resort will be hosting the annual pool party for famous magazine Maxim. The adults oriented atmosphere, new beach club, and stunning pool area make this hotel the perfect space for a party under the Cancun sun. Dog expert and star of the show Leader of the Pack, Cesar Millan will be at Sandos Caracol Eco Resort to promote dog adoptions and to benefit local Riviera Maya animal shelters. We will have two events open to the public with the purchase of a ticket: a Meet & Greet Cocktail Party and a VIP dinner on April 23, and also a conference exclusively for hotel guests on April 24, where they can even start the dog adoption process. Click here to learn more about the Cesar Millan event. Each year, this festival invites some of the best chefs in Mexico and the world to share their talents through several days of dinners, workshops and social events. This year, most of the events will take place in the famous Cancun Hotel Zone. A welcome cocktail party at Sandos Cancun Luxury Resort will be the first event of the festival, offering the opportunity to meet talented chefs in a beautiful place by the Caribbean Sea, on April 27. In addition to our stunning beaches, amazing natural scenery, excellent cuisine and impressive all inclusive plan, we hope our guests also consider Sandos hotels as a place where they can enjoy the most exciting events in the best Mexico travel destinations. We’ll see you soon for your next beach vacation!